Rich and nutty brown butter meets ghee. 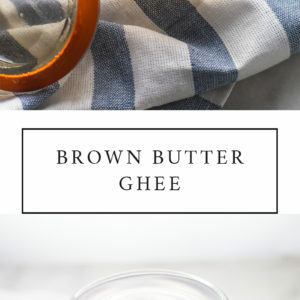 Perfect for adding flavor to paleo or Whole30 dishes, this brown butter ghee recipe is easy to make and will become your secret weapon in the kitchen. I know this looks like regular ghee, doesn’t it? But it’s much, much more than that. This, my friends, is brown butter ghee. You know brown butter by the smell, right? When whatever’s in the kitchen smells like it’s so impossibly rich and caramelized and sweet and delicious that you think you actually might burst? That’s how I know brown butter, by the smell that’s almost impossible. And I’d like to say I developed this brown butter ghee recipe on purpose! I’d seen the brown butter ghee from Tin Star Foods, but I’m too cheap to buy something like that. Nah, I’ll just fantasize about it for the rest of my life instead. 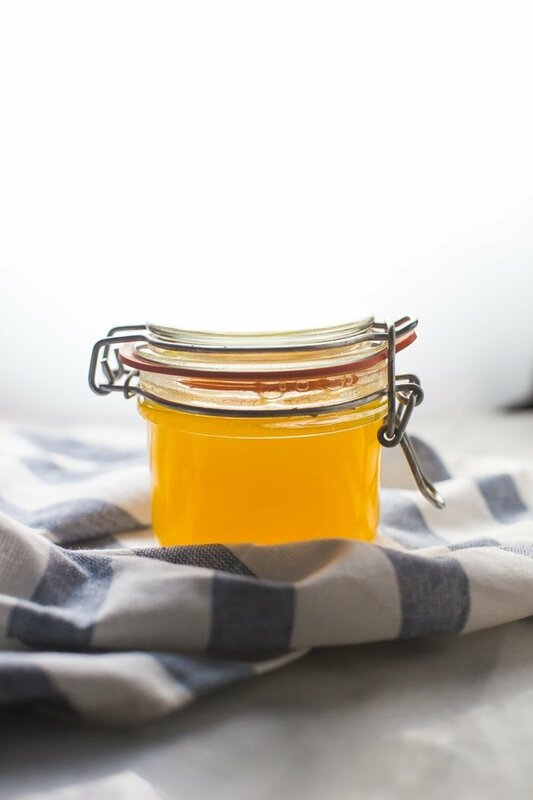 So I wasn’t taking on an ambition to recreate what sounded like the world’s best paleo food when I made this brown butter ghee recipe. Nope. I’d stepped out for a few minutes, at apparently the very crucial moment, and came back to discover that my ghee had turned from that saturated golden hue to a reddish brown with burnt-looking bits stuck to the bottom. I’m pretty sure I blamed my husband and told him everything was ruined and then I sieved it anyway because, well… if it smells this impossibly good… it might JUST MIGHT taste, also, impossibly good. And it did. Impossibly good and nutty and rich and heady and all of those things that take your paleo and Whole30 dishes to the next level. It adds just that extra bit of flavor to whatever you’re making without overbearing the other ingredients. Because the milk solids are sieved out, you’re left only with a hint of the flavor, rather than the dominance of caramelized butter. The trick is to simply make brown butter. You melt the butter in a light-colored pan over medium heat. The butter will pass through a few phases: foaming then bubbling them foaming once again. At this point, the butter will turn a lemony yellow, after which it will begin to turn a nutty brown. You’ll smell when it’s fully browned more reliably than you can see it: wait for that nutty, impossibly rich aroma, and you’re set! From there, you’ll let the pan and butter cool slightly then skim off any solids on top. Most will have drifted to the bottom, so you’ll want to pour off the ghee through cheesecloth or a paper towel to remove all of the milk solids. This is what makes it ghee – the removal of the lactose-containing element. 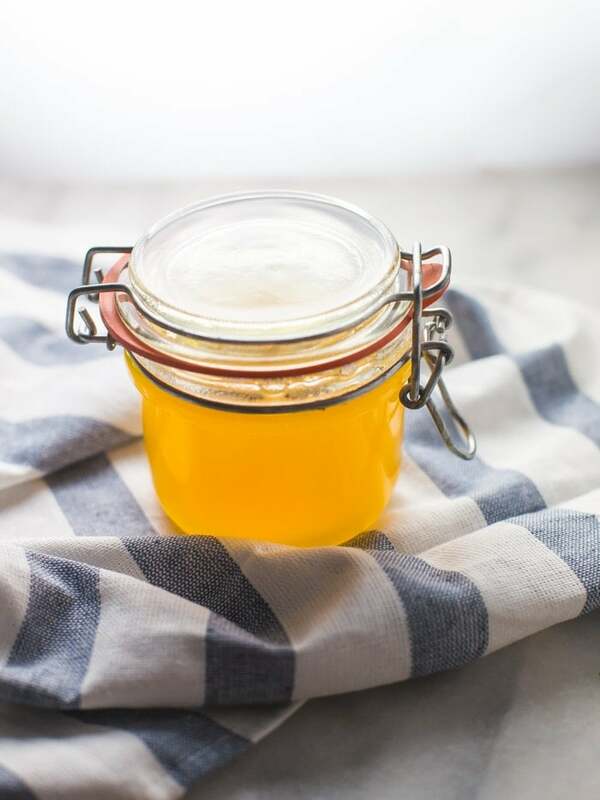 From there, you can keep the cooled ghee in an airtight container in the pantry for weeks… but I bet you’ll use it up far before that! Rich and nutty brown butter meets ghee! 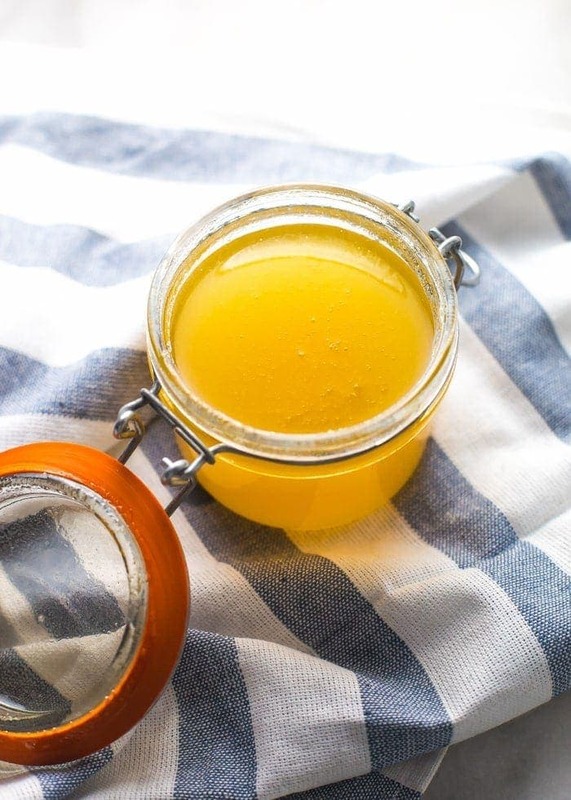 Perfect for adding flavor to paleo or Whole30 dishes, this brown butter ghee recipe is easy to make and will become your secret weapon in the kitchen. Place the unwrapped butter in the medium light-colored saucepan over medium heat. Let melt completely. The butter will foam then bubble then foam again. By this point, the butter will have gone from light yellow to a bright, lemony yellow. Finally, the butter will turn from this bright yellow to brown and will take on a nutty, very rich fragrance. Immediately remove from heat and let cool slightly. Skim any solids off the top then pour through cheesecloth- or a paper towel-lined sieve. Store in an airtight container at room temperature, away from light. I think brown butter might actually BE heaven!